Boxing Clothing: Low Prices and Reviews! When it comes to boxing clothes, I have always felt that you need to dress for success. ...aka- the win! No, that does not mean you need to wear the most expensive and flashy attire when you head to a boxing class. Although you most certainly can if you felt it was the thing to do! In all seriousness, when you venture into a boxing class, you will need the appropriate boxing clothing that will facilitate the proper performance of a boxing workout. The staples of boxing clothes are the traditional boxing trunks and shoes. For women, the inclusion of a sports bra or sports tank top is necessary for in ring sparring. Both men and women can wear a light t-shirt in a training class. Some may wonder if boxing trunks are mandatory for training and the answer is actual boxing trunks are helpful but wearing "regular" shorts is fine as long as they serve the same purpose: they need to allow for complete mobility of the legs all the way up to the thighs. Basically, boxing trunks are tight in the waistband and completely loose in the thigh area. Again, this is to facilitate movement. When the legs are restricted from complete movement, the ability to box properly is hampered. That is why any "civilian" shorts or workout pants that restrict movement need to be avoided. 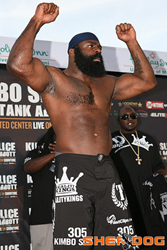 Some may wonder if MMA shorts are workable in a boxing session. The answer is self-evident from watching any MMA bout: such shorts are certainly useful in a boxing session. The same can be said of Muay Thai boxing shorts and, while they are generally out of style, the classic American kickboxing long pants are good as well. You just may get a number of funny looks when wearing them. The UFC wears TapouT, Sprawl, Warrior and several other brands. You can find TapouT, Adidas, Century and Sprawl at Fighter Warehouse and Free Shipping to the USA. 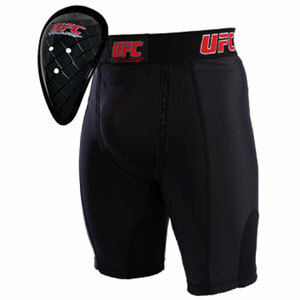 At our MMA Store you can find a sale on shorts such as Century and Sprawl. Boxing shoes are employed for stability and traction. They keep you from slipping when you are boxing. You also want stability in the ankles. However, you do not necessarily need boxing shoes to achieve this as wrestling shoes deliver the same result and cost a lot less. When it comes to MMA, shoes are barred in the ring if you wish to kick. Those opting not to kick but wish to wear the shoes will use wrestling shoes which does come at great risk since they provide a handle for leglocks. Boxing shoes would be a disaster in this regard since they would extend the handle up the shins. Safety equipment is also helpful and one of the most misunderstood items in this regard is the cup. The standard cup used in team sports is best avoided since the chances of being hit in the groin boxing are much higher. This is because a miscue on a body or abdominal shot can lead to direct impact to the groin. A tuck under cup is recommended. You can also wear the full sized exterior cups when training or in amateur competition. In some instances, these cups can be worn underneath the oversized boxing trunks. For those that have serious concerns about groin injuries, steel cups are recommended. The Basix cup pictured is one of the most popular in MMA. When it comes to competition, you will want a nice and bright pair of boxing trunks. You want to be noticed by the judges. As they say in bodybuilding, when you step on stage in front of an audience, you want to look like you take pride in your sport. Wearing quality boxing trunks and boxing shoes in the ring is a must in this regard. It is also a nice touch to wear a boxing robe on the way to the ring. This has been a boxing tradition for centuries and one that is well worth continuing. Ultimately, the goal with wearing these clothes is to facilitate mobility. When you aren't mobile, you can't box effectively. We carry some boxing shorts at our store. 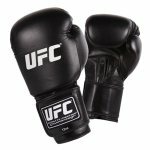 Fighter Warehouse is a deal because they have free shipping to the US and Canada.They have multiple brands and good prices. Revgear Sports Co. has good products and their products have a Spanish flair to them. They are bright and they hold up well. They are quality even though Revgear is not as a big of name as UFC. Bad Boy first sponsored Royce Gracie so it has quite a name. 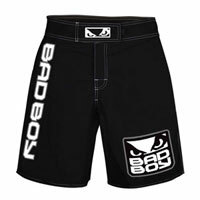 You'll see a lot of sponsored fighters coming out of Brazilian Jiu Jitsu wearing Bad Boy.